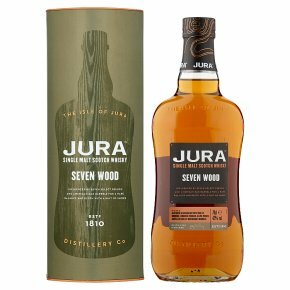 Jura Seven Wood A remarkable ingenuity defines the people of Jura; an ability to reimagine and reinvent that has allowed our distillery and its working community to thrive. Such vision has brought to life this complex single malt - a fitting tribute to our master blender's skill - having been shaped by seven separate oak woods: first-fill ex-bourbon American white oak, limousin, troncais, allier, vosges, jupilles & les bertranges barrels. Influenced by seven select French and American oak barrels for a rare balance and depth with a hint of smoke. Mahogany gold in colour with an aromatic fusion of coffee, ginger spice and a hint of chocolate; followed by caramelised peach, chewy liquorice and candied orange with a hint of sea-spray and smoke in the aftertaste.